When it comes to at-home cardio equipment, treadmills consistently rank as the top choice among customers, reports the National Sporting Goods Association. For many people, space is a valuable commodity in their house or apartment. Thankfully, many treadmills now come in compact sizes. If you're shopping for a small treadmill, look for several must-have features to ensure you're getting the best treadmill model for your needs. The average treadmill measures just 64 inches long and 28 inches wide. Some manufacturers offer treadmills that shave a few inches off of the average width and length. However, because everyone's body is different, it's crucial that you try the treadmill in person to ensure that you're still able to walk or run on it without being forced to narrow your stance or shorten your stride. For additional space saving, look for models that fold up when they're not in use. When folded, you can store the ultra-compact machine in a bedroom closet or even under your bed. Just like a car, a treadmill's core performance comes down to the power of its motor. 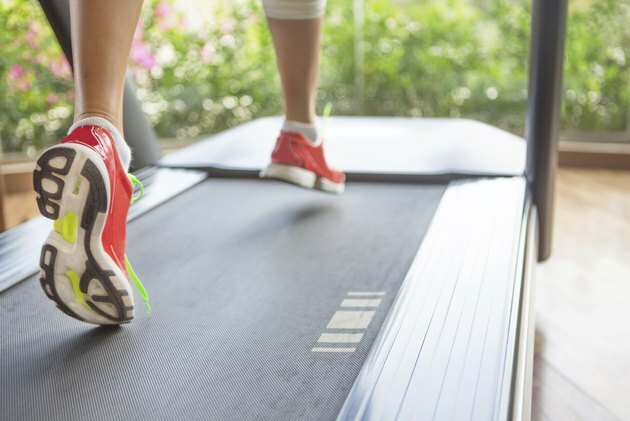 For the best results, look for a compact treadmill with a motor that has a minimum of 2.0 continuous-duty horsepower, advises the American Council on Exercise. "Continuous duty" simply means the motor can sustain extended periods of work. If the treadmill's motor has less than 2.0 horsepower, it may not be able to keep up with your workout or handle your body weight. Know what you plan to use your compact treadmill for, then consider what tech features can help you accomplish those goals. For example, if your core motivation is weight loss, the best small treadmill for you may be one that tracks how many calories you've burned. Other tech options to strongly consider include interval training settings, the ability to track multiple users -- ideal if you're sharing the treadmill with roommates or other family members -- and the ability to store workouts so you can use them again later. Also, don't immediately discount the importance of optional entertainment tech options like Internet connectivity and plugins for your MP3 player. While they may seem like an unnecessary luxury, they can make your workout more enjoyable and keep you more motivated toward your fitness goals. The best small treadmill grows in usefulness as you grow in your fitness capabilities. Look for a model that allows you to adjust its incline or grade, which in turn increases the difficulty of your walk, jog or run. When you're buying a treadmill, the American Council on Exercise recommends a maximum grade change of 10 percent for beginners and 15 percent for more experienced runners. If you're planning on keeping your treadmill for many years and want the most out of your investment, go with a model that offers a 15-percent grade change so you don't find yourself stuck with a machine that can't match your future workout needs. Treadmills take a lot of beatings and fixing them can get costly. The best treadmills come with a three-year warranty on major moving parts, according to "Consumer Reports" magazine.